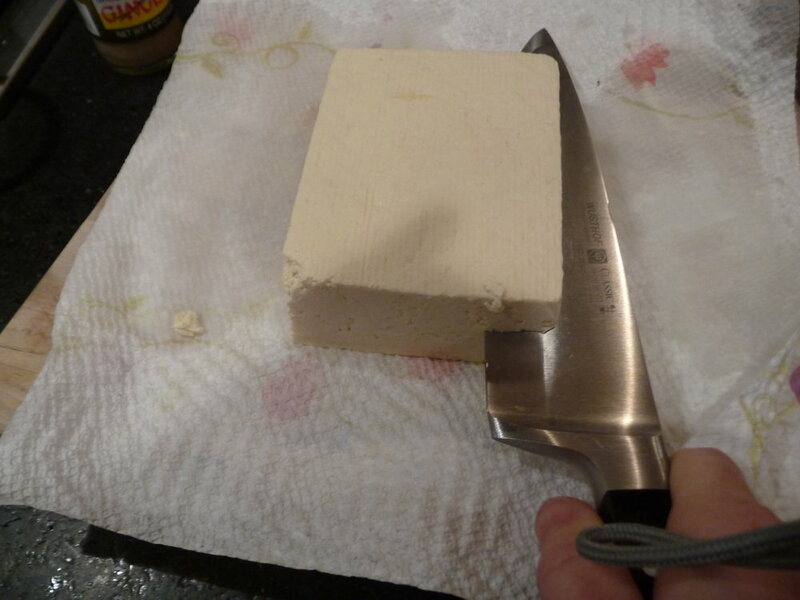 "A brick of tofu. Gently warmed in brown butter." So sayeth my friend Mieke, recounting tales of her mother's horrible, yet memorable cooking. This meal sounded particularly dire. I've tried to make tofu memorable a bunch of different ways over the years, and when Panda was 2 or 3, I hit upon this sentence in The Enchanted Broccoli Forest (one of the Moosewood cookbooks): "Cut into cubes, dust with cornstarch and fry in sesame oil." I cut, dusted and fried, and that's the way I've made it ever since. The kids eat it, we eat it. You can debate the healthiness either way but if you're trying to go meatless a few nights a week, it's a sure thing. And we have Joe on our side. I drive my friend Stacie crazy when I go on about Trader Joe's—apparently he does not reside south of the Mason-Dixon line—but I can't help it. I don't know what I'd do without him. He is a harried mother's true friend. Especially when it comes to the frozen food section, which is filled with staples of last-minute-whip-up-ability. Vegetable birds nests (little latke-type fritters of potato, carrot, onion and scallion); spanikopita triangles; different kinds of gyoza (so essential to Thai coconut soup). Best of all, vegetable fried rice. Can't be without three or four bags of this stuff in the freezer at all times. Redman will eat fried rice down to the last grain and it's one of my best fallbacks after scrambled eggs. In fact, I put a scrambled egg in it. Heat a skillet over medium heat. Add 2 tablespoons canola oil and one tablespoon sesame oil. Yes, that is a reused ziplock bag which at one time did hold Panda's collection of Silly Bandz. Good eye! Put cornstarch in a ziplock bag, add tofu. Zip the bag. Make sure it's zipped. Check again (can you tell I've made this mistake too many times?). If the bag is confirmed as zipped, shake to coat the cubes thoroughly. Fry in the oil, shaking the pan often so that all sides are browned. Transfer to a paper-towel lined serving dish and sprinkle with salt. Add another tablespoon oil to same skillet and cook rice until thawed, stirring often. If desired, scramble eggs, making small pieces, and stir into rice. Shown above is just one bag of rice, and all this here will feed the 4 of us with nothing left. If you have more people, or hungrier people, it's easily augmented by using another bag, or steaming some broccoli or asparagus and serving with soy sauce or any asian dipping sauce.